Last month, I took my friend Garry, who was visiting from San Francisco, to Workshop for his birthday. I'd been hearing great things about the restaurant for a long time, and this presented the perfect opportunity to experience it. Located in the historic El Paseo Building in Uptown Palm Springs Design District on North Palm Canyon Drive, Workshop has been one of the most popular destinations in Palm Springs since opening in 2011. In a city known for its beautiful landscapes, eccentric modernism, celebrity residents and stunning architecture, Palm Springs has been a destination for locals and travelers seeking a smartly refined getaway. 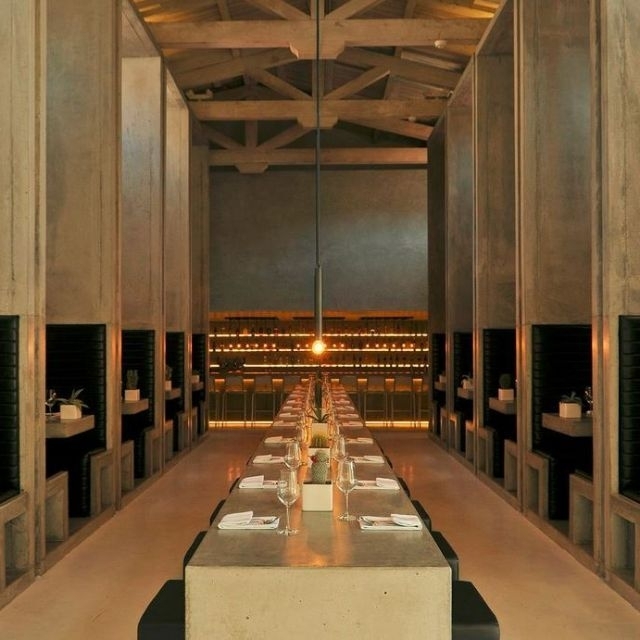 Helmed by Chef/Owner Michael Beckman, along with partner Joseph Mourani, the 2015 James Beard Award-winning restaurant for best restaurant design features a market-driven menu comprised of seasonal food highlights harvested from local farms and offers a bar program, unlike any other desert establishment. I started with one of their famous cocktails, the Hemmingway Especial. Made with white rum, fresh lime juice, simple syrup, fresh grapefruit juice and a little maraschino liqueur, it was light and very refreshing. Garry enjoyed the Bee's Knees. Made with ransom old tom gin, lemon juice, fresh honey, and lemon oils. This Prohibition-era cocktail was originally made to mask the flavor of bad gin and is updated with modern ingredients. This drink is bright, fresh, and complex. For appetizers, we shared the shaved brussels sprouts, with Fuji apple, bartlett pear, persimmon, pomegranate, pepitas, balsamico, olive oil, and pecorino romano, and cauliflower brie gratin, with herb flowers. We then shared the night's special risotto with shaved black truffles, and duck leg confit with duck merguez sausage, young vegetables, de puy lentils, jus, and bloomsdale spinach. Everything was excellent, and the service was outstanding. We will be back! For a contemporary experience in the dining room or a leisurely meal under the olive tree, Workshop in Palm Springs is the perfect desert dining destination. Read more about Workshop here.